Zutano booties are a classic style cotton fabric exclusive to North Shore Depot. Our solid color cotton booties are the same style and design as everyone's favorite cozy fleece booties by Zutano. Each baby bootie has soft and stretchy elastic around the ankle with 2 adjustable snaps to better fit your babies feet. Wear the best baby booties on the market barefoot or with socks. Zutano booties with welcome you to the colorful, whimsical, and uniquely versatile world of Zutano. Located in the quiet hills of Cabot, Vermont, Zutano is inspired by babies every day. One of the most beloved and influential brands in children's fashion and a leader in exciting design innovation. Zutano's boys and girls clothing for preemies, newborns, infants, and toddlers is crafted from only the softest cottons, creating a line known for its superior quality in a rainbow of colors and prints that parents and kids adore. Whether your child is bouncing, romping, jumping, or just napping, our clothing's comfort, fit, and function ensures carefree fun. From their bestselling sun hats to slip-on booties that actually stay on baby's feet, every detail from head to toe is of utmost importance and painstakingly considered. Through Zutano's clothing lines, they are proud to create a world of children's fashion that is sophisticated yet playful and fun yet functional. Zutano is honored to design products that foster a deep emotional bond between parents and their babies during that most special time in everyone's life. As Zutano expands their world, their innovative and exuberant approach to baby products is evident in every category they enter, from nursery bedding, decor, and furniture, to accessories, plush toys, socks, booties, shoes, beanies, sun hats, and colorful baby apparel. From their children to yours, Zutano hope their collection will instill a feeling of playfulness, love, and creativity into the heart and mind of you and your little one. Zutano cotton baby booties are soft and comfortable. The loose fitting soft sole design is perfect for delicate little feet. Baby booties are versatile and better for little feet then tight socks, uncomfortable baby shoes, and stay on better then most baby socks baby shoes, or baby slippers. Booties have a unique two-snap design and soft elastic around the ankle that helps the booties stay on. our customers purchase these adorable booties season after season. Customers rave reviews say Zutano booties actually stay on! 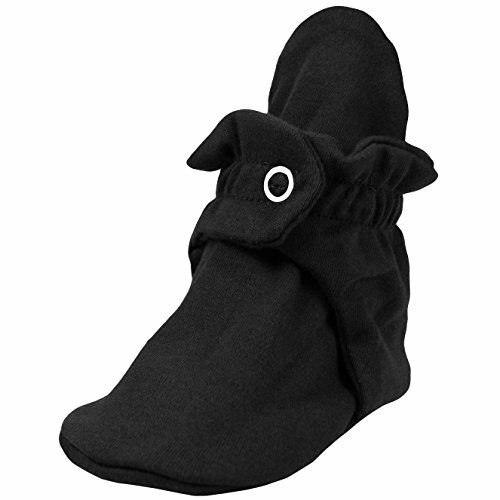 Our customers use these booties as slippers for indoors and in place of shoes and boots. North shore depot has an exclusive on solid color cotton Zutano booties. Out cotton booties are available in white, black, navy blue, and fuchsia hot pink. Cotton booties are lined with Zutano's soft cotton to so little feet are dry, and cozy. Cotton lining allows baby's to stay warm, but will not allow them to over heat. Baby booties can be worn with or barefoot without socks. Zutano's best selling baby booties are a customer favorite for winter, summer, spring, and fall. Zutano incorporates brilliant colors and prints in its versatile line of young fashions. Zutano's boys and girls clothing for preemies, newborns, infants, and toddlers is crafted from only the softest cottons and polyester fleece. Whether your child is bouncing, jumping, or just napping, our clothing's comfort, fit, and function ensures carefree fun, every detail from head to toe is of utmost importance and painstakingly considered. North Shore Depots exclusive colors and designs are available in heather grey, white, black, navy blue, fuchsia, grey with an orange and white stripe, fuchsia with a pink and white stripe, and navy blue with an orange and white stripe. Our color combinations are available in the cotton booties, fleece booties, elf hooded fleece romper, fleece hat with ears, and our exclusive navy blue shaggy furry lined hat. Other Zutano products can be found in designer baby boutique's. If you have any questions about this product by Zutano, contact us by completing and submitting the form below. If you are looking for a specif part number, please include it with your message.